I'm amazed at what animals "learn" with just a few repetitions (i.e. conditioned responses). Pavlov's dogs salivating at the ringing of a bell after the sound is associated with food. Cats learning that if I catch them in my yard using a flowerbed as a toilet that it best to "run" before the barrage of curse words and bullets start. Grizzle bears coming to the sound of a rifle shot since they've learned to associate it with food (usually a fresh elk or mule deer gut pile or a slow, fat hunter). After a successful hog hunt this past weekend, I took two hog carcasses to the field where hides, bones and guts are usually discarded. I guess it has been slim pickin's for the buzzards since deer season ended a month ago. After dumping the pigs, I turned around to what looked like the opening scene from The Birds. 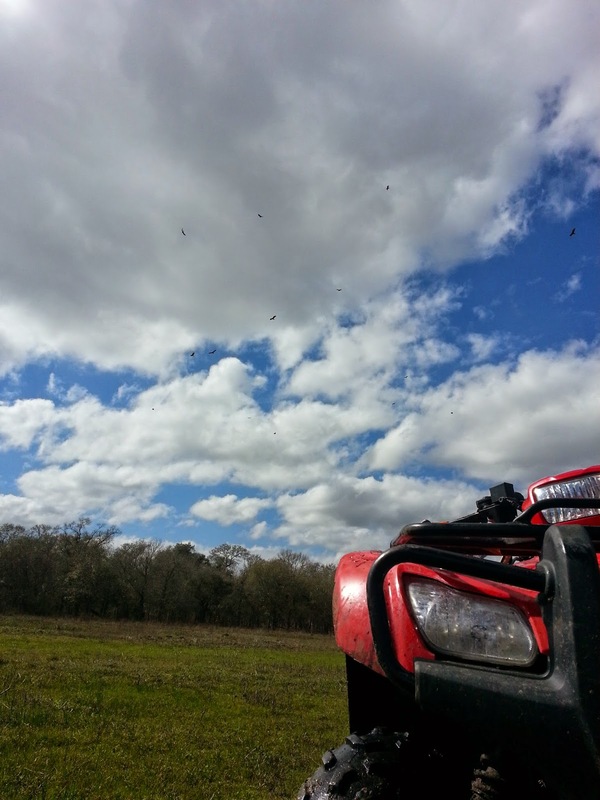 True hunters generally view the world from 1 of 2 perspectives, depending on the calendar. And then there is the "period of time for activities in preparation of hunting season" season. I'm blessed to be on a lease with special rules approved by the Texas Parks and Wildlife department. Our "official" hunting season is 3 months long but that is really just for deer. Hogs, squirrels, fishing, etc. never really has to slow down. So, after a wildly fun, thrilling, relaxing, therapeutic and successful hunting season, we have transitioned into hunting-preparation season. After 5 years in a particular area, I decided it was time to move my main deer stand. I had topographical reasons for this but a main reason was I simply wanted a change of scenery that was a bit more open. 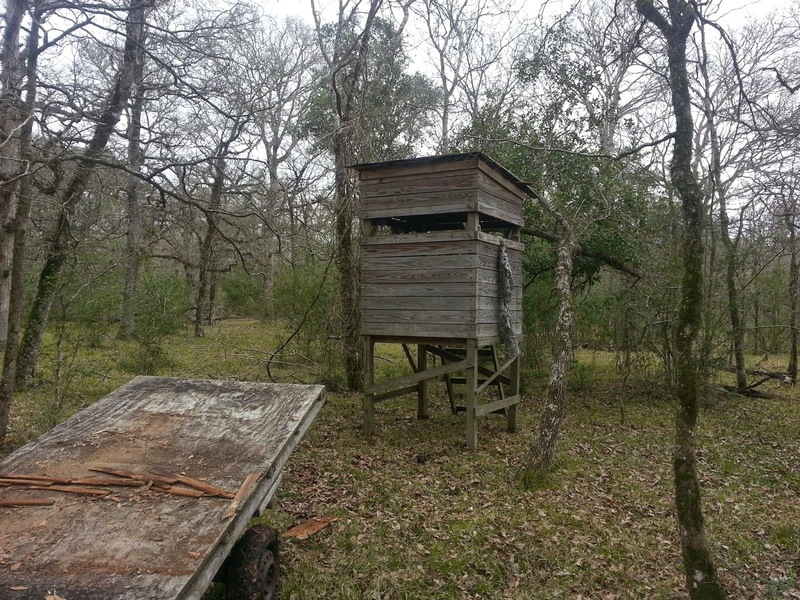 Most new deer stands are brought out to the woods in pieces and assembled on site. This is the easy way. But an assembled deer stand is an entirely different beast. They are heavy, bulky and frequently in various stages of disrepair or rot. It is one thing for 3-4 guys to pick one up and move it 5 feet but quite another to move it 500 yards, through the mud. 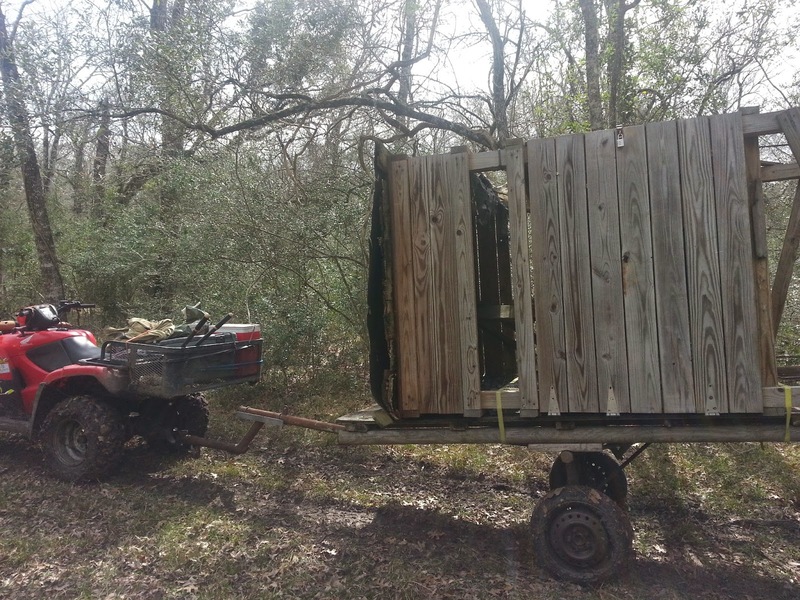 Sometime back, prior to me joining the lease, someone build an official "deer stand moving trailer" out of an old boat trailer. This is redneck / garage engineering at its finest. The wheel base is very narrow to allow it to be pulled over a very narrow bridge. The semi-rotted plywood top is about 3' from the ground and contains the obligatory protruding nails. The trailer is very top-heavy BEFORE you load a deer stand on it but literally "teeters" when a 400-500lb deer stand sits atop. It would be fine to drag around a paved parking lot but over hill and dale with mud, ruts, branches and logs is simply asking for trouble. It is best to have one person slooooooowly drag the trailer / stand combo with a 4 wheeler while another person walks along side to steady it when needed, all the while being prepared to jump for their life in case it flips. But, before any of THAT particular brand of fun can happen, you have to first load said deer stand onto said trailer. The key here is to control the effects of gravity. Two guys can push it to lean over the waiting trailer but 3-4 guys could not stop its descent as it makes its way to the ground at 9.8m/s2. We had the brilliant idea of tying a long rope to the top of the stand and taking up the slack with another 4 wheeler. Once we got it started leaning, one guy slowly backed-up the ATV and gently lowered the stand onto the trailer. This worked better than we imagined. The deer stand was leaning over until it touched the edge of the trailer and with a bit of effort, we had it on its side. Now, we just needed to slide it forward about 4', tie it down and move it to the new site. But as David and I pushed, pulled, lifted, sweated, and grunted, we could only get the stand to move a few inches and then it was like someone had welded it to the trailer. We pushed, we pulled, we lifted, we checked for nails sticking out or the edge of two pieces of plywood hung up on each other. It was officially stuck and for no reason either of us with our 113 years of life experiences could see. Taking a rest to let our discs de-compress, we noticed something. The rope which was currently tied to both the deer stand and a 600lb 4 wheeler 30' away was banjo-string tight. With each pull, lift or push, we were pulling, lifting and pushing an additional 600lbs which happen to be in gear with the parking brake.... locked. Needless to say, once this little fact was discovered, the rest of the loading was pretty much uneventful.